Sql execution failed. Error 2627, Level 14, State 1, Procedure ManagedEntityChange, Line 368, Message: Violation of UNIQUE KEY constraint ‘UN_ManagedEntityProperty_ManagedEntityRowIdFromDAteTime’. Cannot insert duplicate key in object ‘dbo.ManagedEntityProperty’. The duplicate key value is (21090, Jan 16 2014 8:13AM). So I have some duplicate records and as soon as I saw the error I was guessing how I will fix it and I knew it will be nasty fix. In fact the resolution I will show you I do not recommend to do it in Production environment. In such situation contact Microsoft Support for resolution. After deleting that records I’ve received the same error several times again with different IDs. When I’ve deleted them also the error completely disappeared. Once again I want to stress out that you should not try this on production environment. In case of such error better contact Microsoft Support. Nice post! 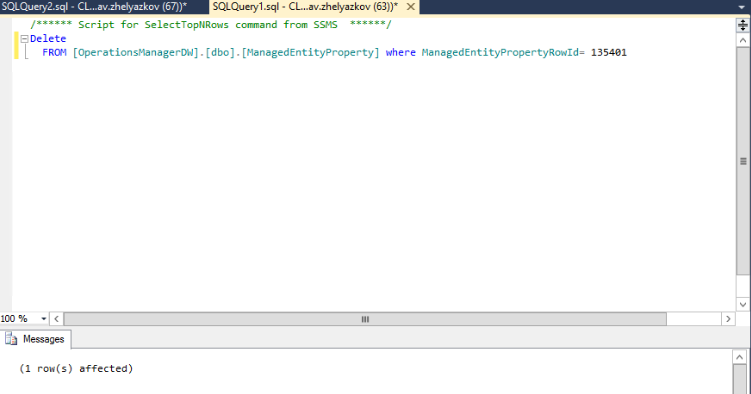 This error is happening in my environment but when I search for the ID only 1 ID is found..
‘SqlException’: Sql execution failed. Error 2627, Level 14, State 1, Procedure ManagedEntityChange, Line 368, Message: Violation of UNIQUE KEY constraint ‘UN_ManagedEntityProperty_ManagedEntityRowIdFromDAteTime’. Cannot insert duplicate key in object ‘dbo.ManagedEntityProperty’. The duplicate key value is (31797, Mar 18 2013 2:00PM). The ID 31797 belongs to a valid machine, I’m thinking in remove this machine temporaly from SCOM. Do you have any other idea? 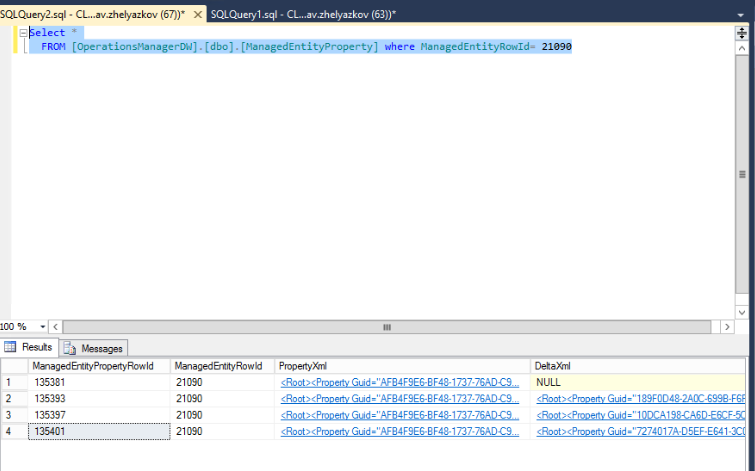 as the SQL table mentioned above has a couple of columns for IDs make sure you are finding the right one. As you can see from the blog post I use one ID and the date to find the unique ID for that table and I delete based on that ID because it is unique. Other users reported that you can get rid of the error if you change the date for the record in conflict or uninstalling the SCOM agent of the server that is causing this. Usually it can be found i the XML files that are for that record.